They were lining up to make fools of themselves after last night’s debate on the ‘Charter for Budget Responsibility’. The Tories, of course, didn’t have to wait until after the debate – the fact that it took place at all made George Osborne look like an idiot. He had dismissed plans for a Labour-sponsored fiscal responsibility act as a “completely feeble stunt” back in 2010, but last night laid himself wide open to accusations that he was doing exactly the same thing. In fact, it seems, he was trying to lay a “deficit trap” for Labour, in trying to get the Opposition party to explain how quickly it intends to balance the books. No dice. Labour was quite comfortable with the charter, pointing out that it sets no date for the elimination of the national deficit but merely puts it in the third year of an undefined ‘five-year cycle’. The strongest words on the subject in the charter are that the books should be balanced “as soon as possible” which, Labour pointed out, is entirely consistent with the party’s own strategy. In addition, as the Institute for Economic Affairs thinktank pointed out in the Huffington Post, no government can bind its successor (force it to continue a policy run by the previous administration). This means that Labour has supported a bill that conforms with Labour plans, and remains free to carry out those plans in whatever way it chooses, post-May 7, if it wins the election. Shadow chancellor Ed Balls was so sure of his ground, he quoted an assessment of Osborne’s debate by the right-wing, reactionary Taxpayers’ Alliance, whose chief executive Jonathan Isaby labelled it a “meaningless political gimmick of the most transparent kind…that serves only to remind taxpayers how dramatically the Chancellor has missed his own original target”. It isn’t often the Taxpayers’ Alliance turns out to be more intelligent than the rest, so let’s give it its due in this instance. Claims are already circulating that Labour’s plans, which allow for borrowing to continue on infrastructure projects – investing in the economy, could add an extra £170 billion (in today’s terms) to the deficit during the 2020s. This assumes that such investment will yield no positive benefits to the economy, and there is no evidence that this would be the case. In fact, experience suggests the exact opposite. An extra £170 billion of spending won’t matter one jot if tax receipts increase by more than that amount. Ed Balls knows this – and said as much in the debate: “Three factors can bring the deficit down: spending cuts, decisions to raise taxes, and what happens to the underlying growth of the economy and the tax revenues which flow from that. The Chancellor did not talk about the third factor, for understandable reasons. You see, while the economy is (technically) growing again, the jobs that have been created are in low-paid, often insecure work and there is lower productivity. As a result, income tax receipts are a cumulative £68 billion lower than Osborne’s 2010 forecast, and national insurance contributions are a cumulative £27 billion lower than he planned. But this was always going to happen with a Tory chancellor. Tories always try to depress wages, in order to maximise profits for business owners and shareholders who vote for them. This means that income tax must fall, yet – bizarrely – they always seem surprised when it happens. The fact that Osborne’s low-wage economy means more working people receive benefits is another cost burden for the Treasury. Labour, of course, plans to eliminate this by getting workers onto a living wage. Osborne’s own plans would cut government spending – mostly on the kind of wealth redistribution that allows the poorest and the working-class to enjoy a reasonable standard of living – by around 26 per cent, totalling a massive 41 per cent since 2010, if a Conservative government is returned in May. 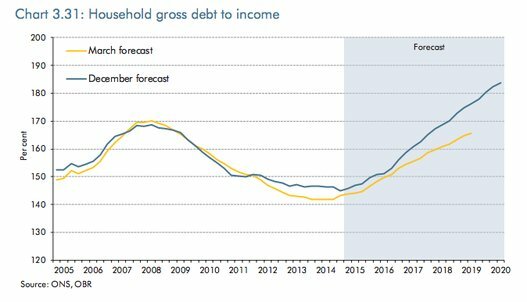 In addition, he is relying on a £360 billion borrowing spree by UK citizens, according to the Office for Budget Responsibility – which will leave households with an amount of debt 180 per cent larger than their income (see the image at the top of this article). Just think about that. Back in 2010, he was comparing the national debt to households having ‘maxed out’ all their credit cards. That was when the debt totalled 78.4 per cent of GDP (the amount of income the nation generates every year). Why is he now saying that households should take on a burden that is proportionally more than twice as large? Of course the comparison between national and household budgets is pointless because they do not correspond with each other, as Green MP Caroline Lucas pointed out in yesterday’s debate. Unfortunately she then went on to make a fool of herself by claiming, on Twitter, that the 18 MPs (including herself) who voted against the charter are the only MPs who are against austerity. If she knows enough to point out the difference between national and household budgets, she should know that this is inaccurate – therefore this was a direct lie to the electorate. The effect of all this bluster – especially on Twitter last night – must be similar to the proverbial turkeys queuing up for Christmas. If anybody still wishes to tell us all that Labour’s plan for economic growth means the party avidly supports austerity, let us look forward to their detailed and clear explanation. Based on current experience, we may be waiting a long time. clarifying why some political critics just don’t understand their subject! and whether they can afford to have heat AND food during the winter. Labour’s deficit plans are mere smoke and mirrors to the public at large with no substance so far we can see. “Jobs guarantee” for 18 – 25 yr olds ? what about the rest of us ? Will they re-nationalise all those services that have been privatised costing hundreds of thousands of jobs ? Will they once and for all close all the tax loopholes for big business ? Will they forbid the sale of social housing (after all it was taxpayers built those homes) ? Will they promise to halt the job losses in the public sector, police and armed forces ? Will they promise to cap immigration to a level we can easily absorb ? Will they scrap university fees ? Definite answers to these questions are important, not wishy washy “infrastrucure and job creation within deficit plans” mumbo jumbo. Having been out on the doorstep I know that Joe Public is intimately aware of the deficit – although many don’t know what’s to be done about it. People know that one party’s way of dealing with it will cause them – personally – a great deal of financial pain, on top of the pain that has already been caused to them. And they know that the other party is keen to achieve better results with as little pain to the population as is possible. They are far less likely to be interested in the subjects of your questions, although I notice that Labour has answered some of them in any case. As they have been answered, I wonder why you have posed them again. Wellllllllllllll… it’s not quite true that Caroline Lucas made that claim herself. It was someone else’s tweet, and although she did RT it on her account, we have to remember the unspoken Twitter rule “RT is not necessarily endorsement”. … and then Natalie Bennett gleefully RT’d it as well. What are we supposed to think? Are you getting paid by Labour? Look it’s your blog but Labour are a centre right, Tory lite, neoliberal, Friedman doctrine followers. They stand for slightly tweaking and sellotaping up a completely broken economic system, where the power to create money is left in the hands of banks and private interests, where unsustainable consumerism if built into the system, a long with exploitation, greed, immorality, inequality and inefficiency. How can you be so vociferous in your support for a party that offers no alternative to the unregulated capitialism that has been so detrimental to the world? I don’t agree with a single word of that, for reasons that are clear if you read even a few of the several thousand articles that comprise this blog. You are on my facebook, I read, like and share a good few of your blogs, yet you come across as bias towards labur in more than one. Maybe you should read a few of your thousands of articles again and look for bias. Which is weird considering the tone of most of the rest of your articles I agree. You don’t have to agree, much of what I said is not subejctive. Consumerism is unsustainable, you cannot have infinite growth on a finite planet. The current monetary system rewards exploitation of cheap labour, which in turn exploits people, which is greedy and immoral. You’d have to be blind to say the current system does not create inequality. Planned obsolescence is built into some products, ensuring limited lifespan, wasting resources in order to maximise profit potential. Many products are created in the cheapest way possible with the cheapest materials that can be found, so they do not last long even if they are meant to. This is a small example of the inneficiency that is built into our monetary system. You don’t have to agree with any of it mate most of my points are facts. What are Labour’s ideas? Make more small businesses? Ringfence the banks? Yeah that will go far to stop the cycle of boom and bust and address unsustainable consumption. I have just been on their website reading all their policies and saw nothing that indicated any real change, just less brutal, more populist ways of kicking the can down the road. He makes some good points about the current labour party’s left wing credentials. I don’t have to show impartiality – if you want that, look in the newspapers (and see if you can find any)! This is a Leftie blog, no doubt about it. It’s about finding the political solutions that actually work, rather than slavishly following any particular party, though – and that’s why I attack Labour when I believe it’s out of line. That’s also why I’m not going to accept any criticism from you. You clearly make assumptions about what I’m saying (“You’d have to be blind to say the current system does not create inequality.” When did I say that?) and also make unfounded claims (“Most of my points are facts.” Really? Back them up. Actually, don’t bother – I’ve got better things to do). I’ve got a lot of respect for Tom on AAV but he’s a very strong supporter of the Greens – as he’ll happily admit – so there’s bias on that blog too.